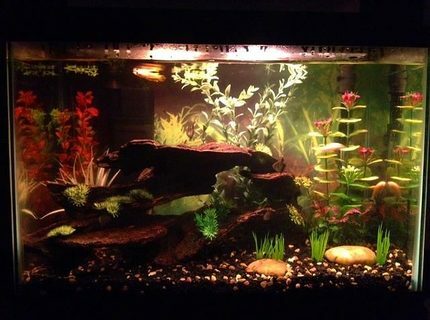 About Yourself: One of my friends from school showed us his tank and it caught on like wildfire. Great hobby and easy especially for a college student like myself. Advice: If you plan on using any rocks or pieces of wood you find, I suggest taking every step possible in cleaning them. I power washed both the rock and wood, soaked the wood in a vinegar/water solution overnight and re-power washed them. I soaked the wood in a bleach/water solution, then power washed again and boiled for increments of 15 minutes until the water was clear. Definitely worth it. Description: new setup for my 55 gallon. lots of river rock with a large piece of driftwood in the background for decor. Quote: "Light travels faster than sound, that's why some people appear bright until you hear them speak"
About Yourself: I'm and avid fish-goer. I took up this art (because it's not just a hobby) years ago to actually learn the feeding habits of various types of fish. Why? I love to fish, and seeing how fish are and how they eat, helped me with figuring out just how to refine my sport fishing. Also, there is nothing better than coming home and feeling the peace and tranquility of being able to watch the our personal National Geographic at home. We have seven tanks, each built out with separate habitas, everything from African set ups, amazon set ups, river and tropics. I try to get fish that are unique and rarely find in home aquariums. I love having friends over who feel as if they should have paid an entrance fee just to see the exhibits we have set up. Lastly, although a very expensive habit, it's something I can do at home and save from having to go out and look for fun! Fish Kept: In this tank we have our flowerhorn, a catfish, two butterfly fish, and some chiclid rams, there is a pleco who's grown quite a bit, and a few barbs that hang around the base of the drift wood. 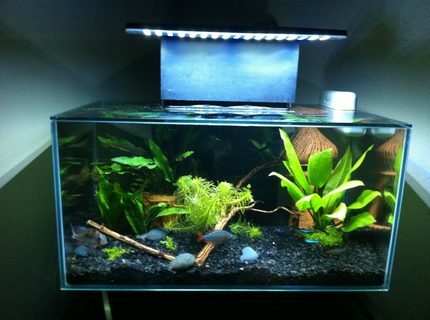 This tank represents, peace and tranquility! :) And luck of course. Corals/Plants: Had this one full of live plants before, but they were quickly turned into lunch for the tank inhabitants. Advice: Take it slow! - Or sometimes be willing to take losses. And definately do your homework to ensure you are capable of supporting your fish and it's needs. 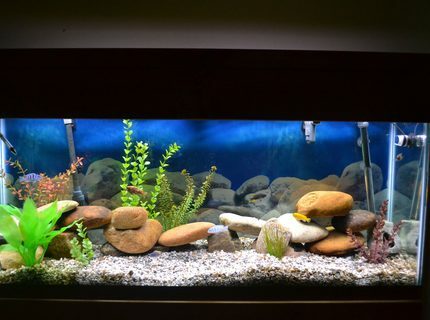 Description: Our tank, with fish... there is our flowerhorn, a catfish, some butterfly fish, and some chiclid rams :) and a pleco! About Yourself: As a military family we moved a lot and I promised we would get a tank when we finally stopped. We're about three weeks in and it's been a lot of fun so far. Fish Kept: Gourami, Neon, Black Neon, Black Skirt, Emperor, Glowlight, and Pristella Tetras, Rainbow Shark, Giant Danios, and Guppies as well as Ghost and Algae Eating Shrimp. Corals/Plants: All fake so far, trying to keep it relatively simple initially. Advice: Talk to experienced hobbyists and your local pet store fish experts and read/research books and on-line. This website and Drs. Foster and Smith came recommended to us and are very helpful. Description: About three weeks into the free 55 gal tank we got from a neighbor. Quote: "By Any Means Necessary!" Advice: Do your homework, use your own GOOD judgement and reasoning, hang tuff, and wait for the "payoff". 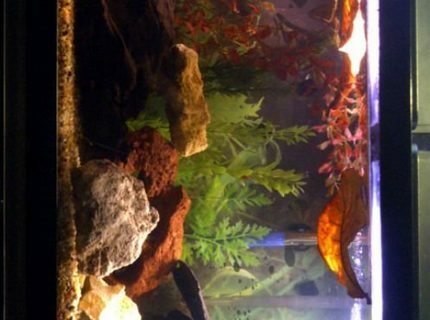 Description: My tank with Golden Wonder lurking at the top. Quote: theres more to fish than meets the eye. 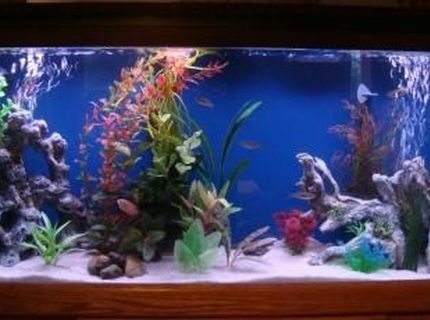 About Yourself: I first began fishtanking when I was a little kid with a mere 5 gallon tank full of goldfish I won at a carnival. Ever since I've just always loved watching fish and owning fish. 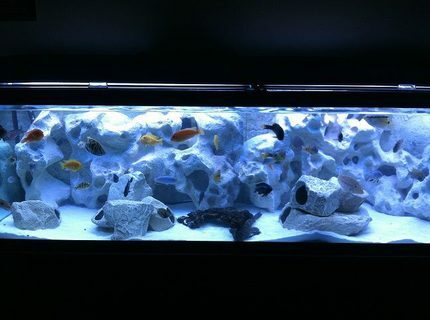 I love designing the landscape for the fish to explore. I just recently converted my 25 into a 55 Gallon tank, and only a few days ago made it into a black water environment. 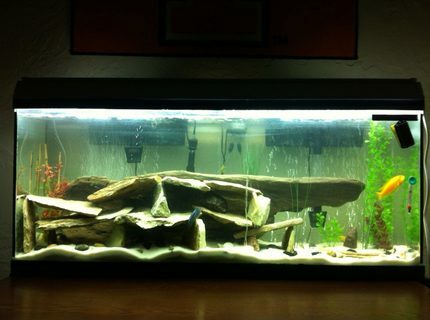 My favorite fish would have to be my black ghost knife which I have watched grow from a few inches to almost 9 now. I take great pride in my tank. Corals/Plants: All fake, live plants cannot live in blackwater. Advice: DO NOT BUY CHEAP FISH OR FISH FROM PETSMART. DO NOT OVERCROWD OR OVERFEED. 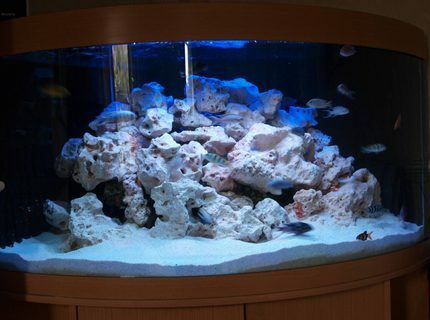 Quote: One day I want a fish tank big enough I can swim in. About Yourself: I started out buying a 20 gal goldfish tank for my daughter and became obsessed. I rescued what I though was a pleco from a horrible fish store who actually turned out to be a lace catfish(now named Igor)and bought my first 75 gal for him to fit in. 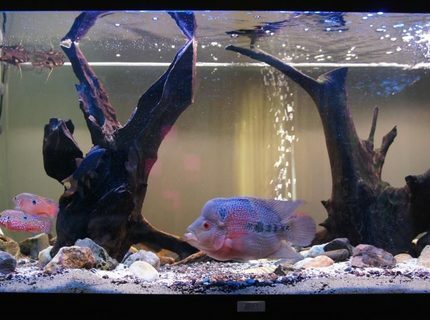 I bought my first "cichlid" a Jurupari named "Geo" soon after and I was hooked. The goldfish are now in a pond we built in the back yard and we now have 3 fish tanks. 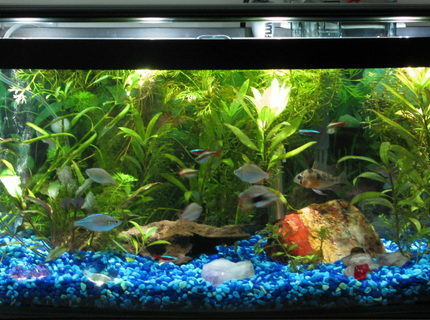 Advice: Never overstock your fish tank. Always research a fish before purchasing it to know what you are getting into. Find a local small fish store and purchase your fish from them, dont shop big chains.